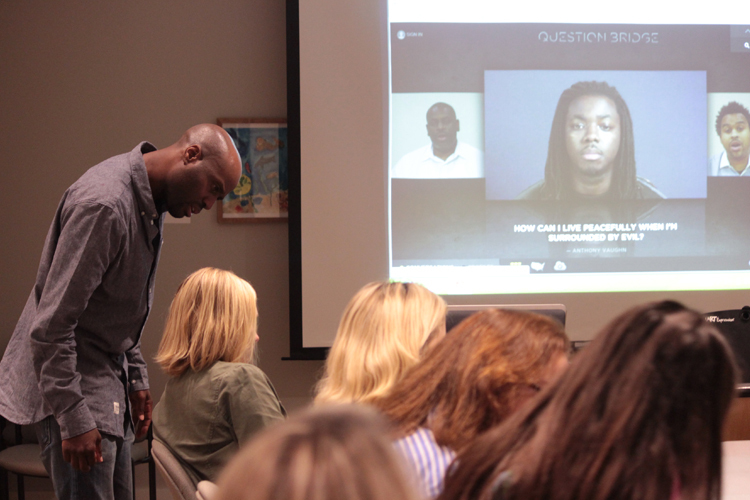 Bayeté Ross Smith discusses Question Bridge with Phillips School Programs Educators last month. 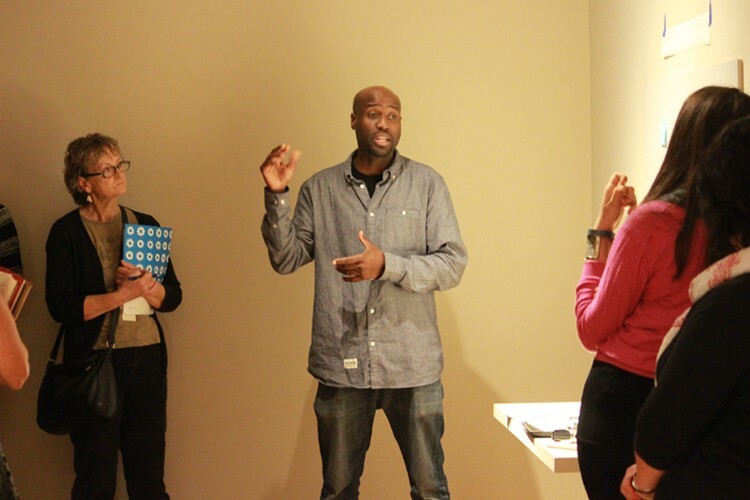 On Wednesday, October 7, Bayeté Ross Smith, one of the creators of Question Bridge: Black Males met with Phillips School Programs Educators to discuss strategies on how to integrate the themes and content of the exhibition into school tours. On view through January 3, 2016, this documentary-style video installation seeks to represent and redefine black male identity in America. Bayeté Ross Smith and Phillips School Program Educators during October’s session on Question Bridge. During his presentation, Smith exposed the group to the many ways educators can engage with the project through the Question Bridge curriculum, website, and mobile app. The curriculum aims to help students develop a variety of skills, such as building cultural, visual, and multimedia literacy. Furthermore, it allows students to engage in the essential, overarching question of how we can create equitable environments of inclusion in our diverse 21st century society. Composed of eight functioning modules with specific learning goals, based on themes such as “The Human Condition,” “Code Switching,” and “The Power of Communication,” the Question Bridge curriculum offers an alternative way for workshops to be structured and students to engage with the material. Each module includes a student workbook and teacher guide, which consists of a list of additional resources and a glossary of terms for reference. On Thursday, November 12, the Phillips is hosting an Evening for Educators focused on Question Bridge. Find details and register here. This entry was posted in Exhibitions and tagged Bayete Ross Smith, black male identity, community, curriculum, education, healing, identity, Question Bridge, race. Bookmark the permalink.